JNTUK 4-1 Time Tables 2018: JNTUK B.Tech 4-1 Sem (R13,R10) Regular/Supply Exam Time Tables Oct/Nov 2018 are released. Students can check jntu kakinada IV year I sem end examination time tables 2018. 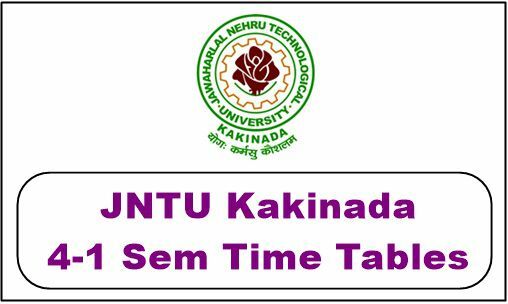 Jawaharlal Nehru Technological University, Kakinada (JNTUK) has announced the B.Tech IV year I Semester R13, R10 Regular/Supplementary Examination Time Tables October/November 2018 on it’s official site. The Candidates who are looking for the 4-1 sem time table, All those candidates are requested to download the IV year I sem Time Table 2018 from below. After that, the students are advised to start preparing for the semester examinations. You can also get the regular and supplementary examination Jumbling Centres from the official website or here. As per the schedule, the examination will be held from Friday, 26th October 2018. Procedure To Get JNTUK 4-1 sem Exam Time Tables Oct/Nov 2018? The candidates who are searching for JNTUK 4-1 sem Exam Time Table 2018 you will need to visit the Official website or click on the above links. 1.2 Procedure To Get JNTUK 4-1 sem Exam Time Tables Oct/Nov 2018? When is the last attempt/chance to write exams for R10 batch students.